As you know, I love subscription boxes. Getting mail is rad. Getting a box of something fun in the mail is even better. And when that something fun is something I can eat, even better. The second half of this equation is the difficulty I (and many others, I’m sure) have with eating a healthy breakfast when you’re rushed to get out the door in the morning. 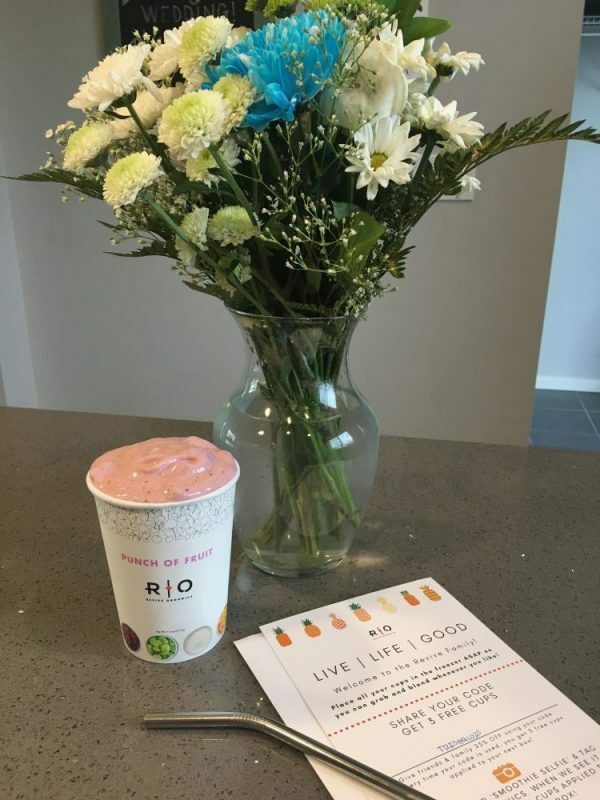 So, I tried Revive Organics, a Canadian smoothie subscription company. I like to support Canadian companies whenever I can. It’s not always possible to shop super local (which is super good for our economy and our environment), but supporting a business in my own country instead of one from another is still helpful. Revive Organics is based out of Toronto, Ontario. When I saw an ad for Revive Organics, I clicked. And, I got to try their weekly smoothie subscription for fifty cents. I thought I’d share my thoughts with you. This review is not affiliated with Revive Organics and I get no compensation for this review. It was something I wanted to try and tell you about my experience. I tried Revive Organics smoothie subscription for a quick, easy, healthy breakfast. Revive Organics is a subscription service that ships you frozen smoothie ingredients in pre-measured recipes. It’s a neat idea and definitely has some benefits. Although, not my brightest idea to try a frozen/cold breakfast deal the week before autumn cold hit. The week I tried these, it snowed. Yes, SNOWED here. All I wanted was to curl up with a hot bowl of oatmeal of something and instead was clutching at a cold cup of frozen blended fruit and a sipping from an icy steel straw. Not my best planning moment. Although, who could have guessed that the first week of September would be quite that cold. It’s healthy breakfast made easy. You can choose from six, nine, twelve or twenty-four smoothies delivered weekly, or twenty-four smoothies delivered monthly. The smoothie ingredients come packed in disposable cups that you fill with your liquid of choice (they suggest vanilla almond milk, I used 1% cow’s milk). After adding the liquid, you dump the whole thing into your blender, blend it, pour it back into the cup and ta-da, you have a smoothie that is more interesting and probably healthier than my usual blend of milk, yogurt and whatever frozen berries I have in my freezer. The smoothies are super easy to grab and go, the cups they come in are paper with plastic lids and fit well in most car cup holders. I took mine on a walk, in the car, and even to an appointment. Your subscription also comes with a reusable stainless steel straw and a handy straw brush to clean it with. The smoothies come packed in dry ice packets to keep them frozen. According to Revive Organic’s website, the smoothie ingredients are flash frozen within hours of being harvested. This is to retain the freshness and nutrients and avoid the use of any additives or preservatives. The ingredients are all sourced from organic farms. Most of the smoothies are vegan too. The smoothies are delivered to your door in a box with packaged dry ice to keep them frozen until you can put them in your freezer. You pick your delivery day and get email notifications from Fed-Ex when it’s on the way and when it’s delivered. I got my email notification that my smoothies were on the truck for delivery at about 9 am and they were at my door at about 4 pm, still frozen solid. The cups stack quite well in my freezer too. The smoothie flavours are unique and some of them are really tasty. When you sign up, you get to pick which flavours you want in your next week’s delivery. Each recipe has ingredients like fruit, veggies, spices, and nuts. Each week, there is a cutoff date to change your order, which you can do in their little online portal. I chose six flavours to try in my Revive Organics smoothie order. This same cut-off date applies to cancelling or pausing your subscription. If you miss the cut-off, you are automatically charged for another week of smoothies. And, pausing or canceling your subscription isn’t easy, you have to email them. There is no pause or cancel button in the portal. This felt a little sneaky to me. It’s a pricey way to get your smoothie fix. At a range of $7.99-$8.99 CAD a cup, it’s an expensive way to get your healthy breakfast. The ingredients are definitely more expensive than what you would likely use to make a smoothie at home. And the variety of on demand smoothies in your freezer is also something that you get by buying them this way. But, if you’re a budget conscious family, it’s an expensive endeavour. The smoothies were tasty. Especially once I figured out how long to blend them for. A couple times, I blended them too long and the texture was off. It was weird and unpleasant. I found that some of them, once blended, were too much for the provided cup. So I either had to find a new cup to transfer it into or ended up wasting some of the smoothie and pouring it down the drain. The instructions that come on the cups say blend until smooth. The instructions I found online specified 30 seconds. I suggest sticking to the 30 seconds. It’s harder to pour back into the cup, but it doesn’t get the gross fluffy texture. Also, green smoothies… nope nope nope. Not for me. I spent $8.99 on a second serving of a smoothie I took two sips of and had to toss. But the cost and amount of waste that comes with them is a little off-putting for me. For some people, $53 a week on easy, quick, healthy breakfasts is completely worthwhile. They want to be able to grab and go and sip their smoothie on their commute. Cool. I’m not that person. I like variety in my breakfasts and a smoothie every day is boring, even if I have a range of flavours to choose from. Also, it’s autumn here and while the snow is gone for the moment, it could be back at any moment and I can’t sip a frozen drink when it’s -30C outside. While the subscription does come with a reusable straw, there is so much more waste in the cups and the lids (not to mention the packages of dry ice that come with them on delivery). I’m trying to produce less waste, recycle and compost as much as I can. And this just isn’t ideal for me. Overall, I’m glad I tried it. I love the idea. But, it’s not the right service for me. I still have a few smoothies in my freezer though, to pull out when I want a smoothie fix. If you want to try Revive Organics, their instagram is quite active and they often have deals there or on their website to get a few extra smoothies for free. Writing Prompt: I just cleaned these floors! Tldr: I was really disappointed and surprised by their lack of ethics and customer service. According to their policy on their website, you can email them to pause your subscription and not be billed or charged during their time. So I emailed them to pause my subscription bc I was going out of town for several weeks and they emailed back that it’s ok. However they continued to bill and charge me for 3 orders while I was away. When I found out and emailed them about this, they didn’t apologize but wrote that I could have cancelled my orders online. When I responded that this is different from their policy/their email and asked to speak to a manager and have my subscription cancelled, they said they’d refund me and cancel my subscription. So I checked my profile/subscription on their website, and I had still had orders pending on my profile. And when I checked my visa statement, they only refunded me for two out of the 3 orders. When I followed up about this, they just said that they can’t refund me one of the orders and didn’t explain why. Wow, that’s brutal. I found it really confusing too and ended up getting a second order that I didn’t really want before I managed to successfully cancel the subscription.